The Thermapen Professional thermometer is the UK’s number one selling food thermometer. 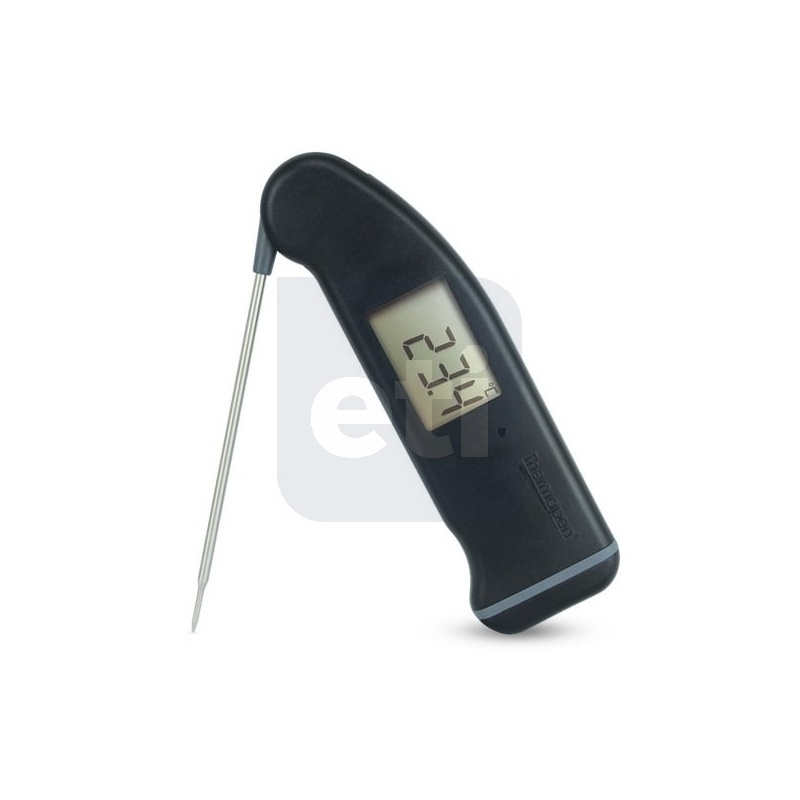 Measuring temperature over the range of -49.9 to 299.9 °C and used by hundreds of thousands of discerning cooks worldwide, it offers a combination of speed, accuracy and convenience of use. The new Thermapen Professional uses advanced technology and includes a number of innovative features illustrated below - Click image to download PDF. The Thermapen Professional is fully configurable using buttons in the battery compartment. Here you can choose to lock the display position, disable auto-sleep mode, choose °C or °F scales and select 1° or 0.1° resolution. The patented 360° self-rotating display can be used in any position, in either hand and is truly ambidextrous. The Thermapen Professional incorporates an intelligent backlit display sensing light levels, automatically turning the backlight on/off in varying light conditions. The motion-sensing sleep mode with user changeable time delay automatically turns the Thermapen on/off when set down or picked up, maximising battery life. As well as being waterproof to IP66/67, it is still 'probably' the fastest reading contact thermometer on the market today . The true temperature of a product can be tested in just three seconds. The Thermapen Professional incorporates a reduced tip, stainless steel, food penetration probe (Ø3.3 x 110 mm) that conveniently folds back through 180° into the side of the instrument when not in use. The Thermapen Professional is powered by a single AAA battery with a life expectancy of 3000 hours in normal use, without the backlight. 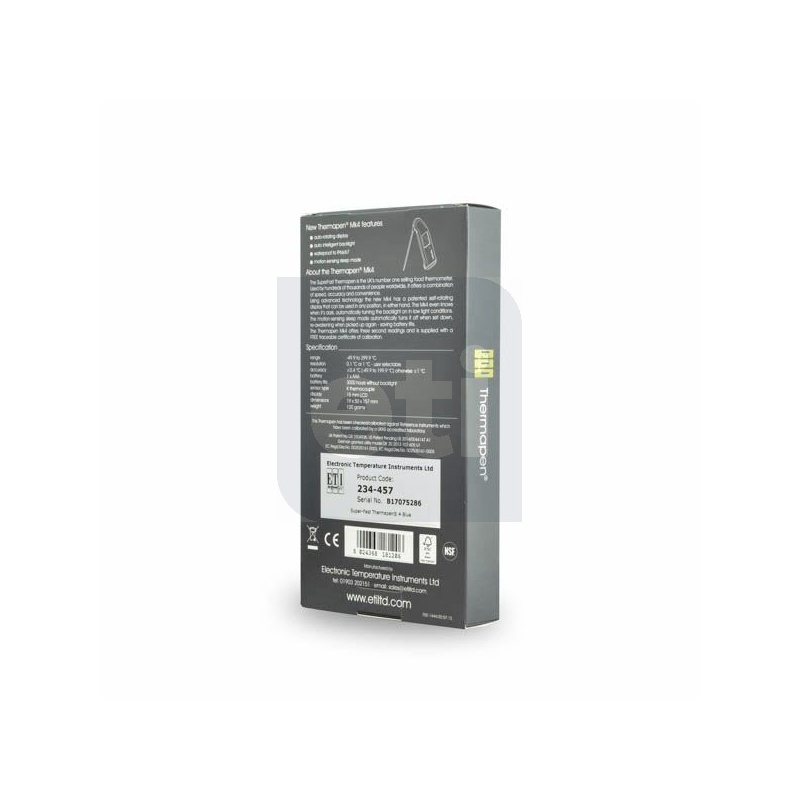 Both low battery (icon) and open circuit indication are displayed, when applicable. Each Thermapen Professional is supplied with a FREE traceable certificate of calibration. Thermapen® is a registered trademark in the UK (2025607), EU (008449571) and the USA (3898535).